In an earlier post, I already introduced the Chinese eating habits on their long train rides. Food plays an even more important role in the lives of holiday makers than it is for people in their everyday lives. The most exciting things to do in foreign places is seeing unfamiliar landscapes or buildings, meeting people with different habits than yours, and enjoy the novel flavours and textures of the local food. In recent times, gastro-economic tourism has become one of the most interesting and fastest-growing types of holidays. Moreover, it also enjoys increasing interest of researchers. Tasting local food is often considered as both cultural activity and entertainment, a necessary part of tourism experience. 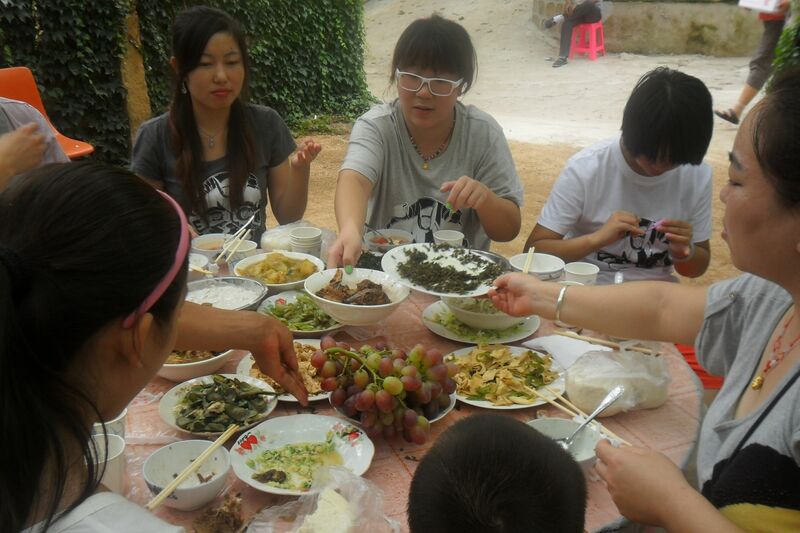 In addition, tasting local foods has become an important way to enjoy the local culture. However, local foods can also be an impediment to tourist experience. Some local foods can only be accepted by mass tourists when adapted to tourists’ taste. Two natural tendencies are diametrically opposed to each other in the acceptance of novel food: fear for the new and longing for something new. The former people long to try new or unfamiliar food. Local food at a destination can bring tourists physical, cultural, social and prestige experience. Local food consumption can be seen as a supporting experience and even as a peak experience for tourists. On the contrary, people who are afraid of unfamiliar food tend to look out for international chains or eateries offering international cuisine. This poses challenges to popular holiday designations as regards the presentation of the local food as an attraction at the risk of potential impediment. To make local food an important attraction requires in-depth understanding of food psychology and tourists’ food preferences. It is especially important to please the palate of even the most conservative tourist. The apex of experience new foods during your holiday is the gastronomic holiday, trips specially undertaken to experience the flavours of all foods and beverages a destination has to offer. Gastronomic or culinary tourism can be defined as an activity in which people participate in “other” food culture, including the preparation of food. Also, and perhaps especially, for those tourists, regions need to standardise their traditional foods, so that hotels, restaurants, travel agents and other organisations involved can introduce them properly in their promotion campaigns, ensuring that participating tourists get what they pay for. In other words, if a region decides to make its local cuisine a major tourist attraction, it needs to study that local tradition, inventorise and standardise it. 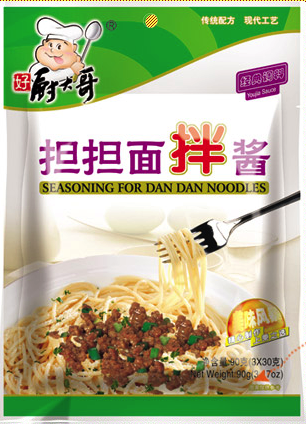 To give a Chinese example: if you want to advertise dandan noodles as a representative Sichuan snack, then you cannot just serve the tourists any bowl of dandan noodles as served by a random vendor on a Chengdu street. It has to be that dandan noodles as shown in the brochures and websites, lest the finicky tourists will complain that they are not being served ‘the real thing’. However, critical sounds can also be heard. Some people warn about downgrading local culinary traditions, in particular those of national minorities, to stereotypes, sometimes referred to as the disneyfication of minority foods. 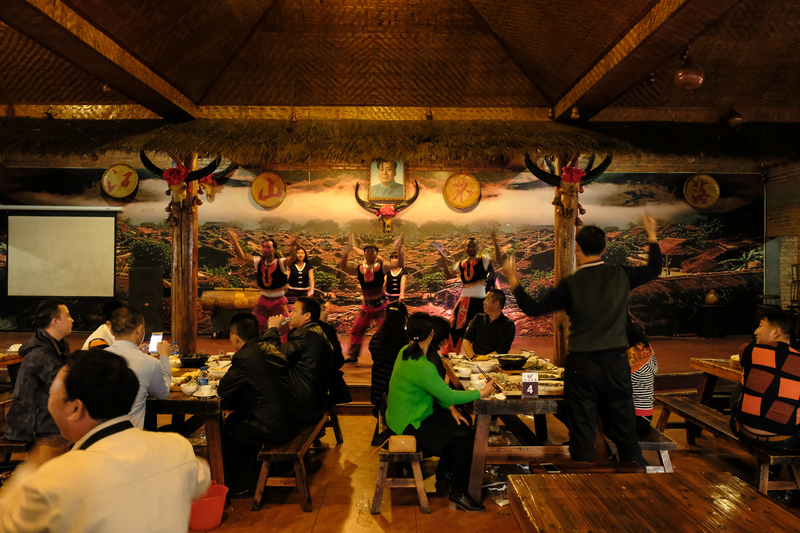 The following picture shows Han Chinese enjoying minority food and dancing in a rather stereotypic ambiance. The other side of this development will be a change in that very local tradition. Once the local tourism planners have crafted standard description of the most typical local dishes, and hotels and restaurants catering to tourists from other regions have adopted those recipes, the local consumers are bound to be affected by this. 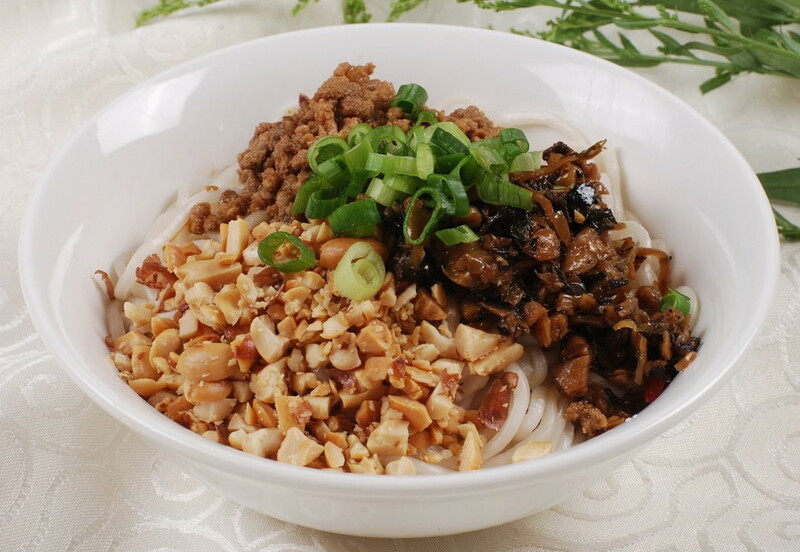 Now if you feel like a proud Sichuan person, you do not just make dandan noodles at home like your mother taught you. No, you put in an effort to make the real thing, the genuine dandan noodles. The same applies to gongbao chicken, yuxiang pork, and other Sichuan dishes. Those dishes are also served by restaurants elsewhere in China and Chinese restaurants all over the world, using more or less standard recipes. The developments described above create a market for producers of seasonings and condiments. I have reported about this in previous posts. The modern Chinese consumer is not willing anymore to spend hours in the kitchen preparing breakfast, lunch and dinner. One way to save time is using ready to use sauces bought in your local supermarket. 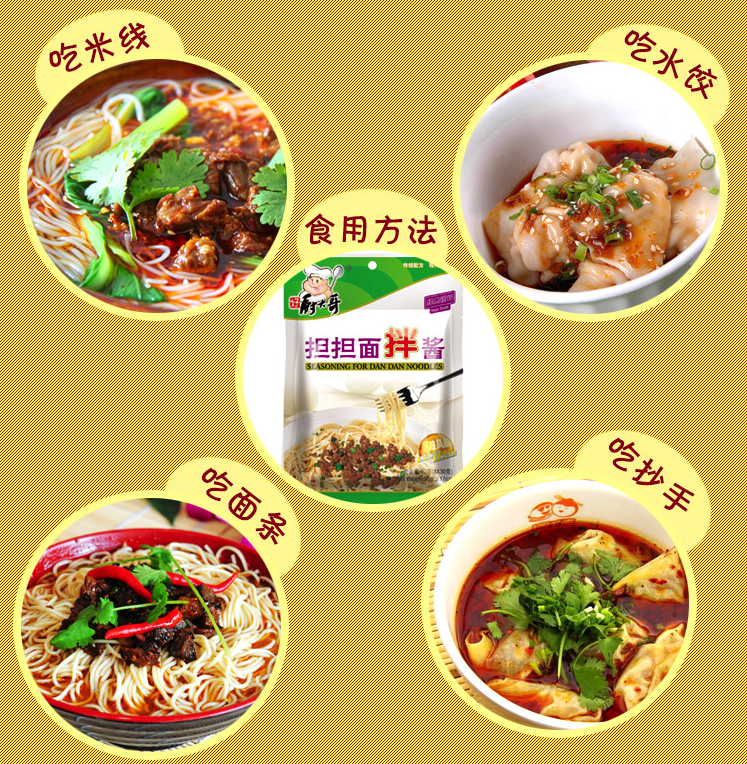 The R&D Departments of seasoning makers can concoct a dry or wet mix of ingredients to prepare an instant dandan sauce in your own kitchen, when you wish to reproduce that great dish that you had during your holiday in Sichuan. You only have to cook the noodles and perhaps add a little of whatever you like in your noodles (for me that would be minced pork), and you can enjoy a bowl of ‘genuine’ dandan noodles in no time with no hassle of finding and mixing all those spices. Here is a randomly chosen example of such sauce. Interestingly, the producer also tells potential buyers that this sauce can be used to spice up other dishes as well, like dumplings. Near Shijiazhuang (Hebei) an industrial city more commonly associated with chronic pollution problems than clean dairy — lies Junlebao Dairy Industrial Tourism Park. The sprawling collection of fields and buildings was opened in 2012 by Shijiazhuang Junlebao Dairy Co. Ltd., to teach Chinese consumers about milk. The attractions — marked with bilingual English and Chinese signage — show visitors how cows are milked and fed, and there’s also a museum devoted to dairy science. “[The park] is the world for cows. It is also the paradise for cows,” one sign reads in English. Claire Lee, a 25-year-old tour guide at the park, says it’s important to rebuild consumers’ trust following the 2008 scandal. “People can come here to see what they drink every day, and they will have faith again,” she says. The site was awarded the second-highest grade in the national tourism administration’s ranking system for attractions, and it has drawn around 500,000 people over the past two years — but it’s also a working farm with 4,500 cows. This post describes the relationship between tourism and food industry in about any region of the world, but China, with it rich culinary diversity is the best region to serve as an example. The rapid development of domestic tourism is also facilitating this development. 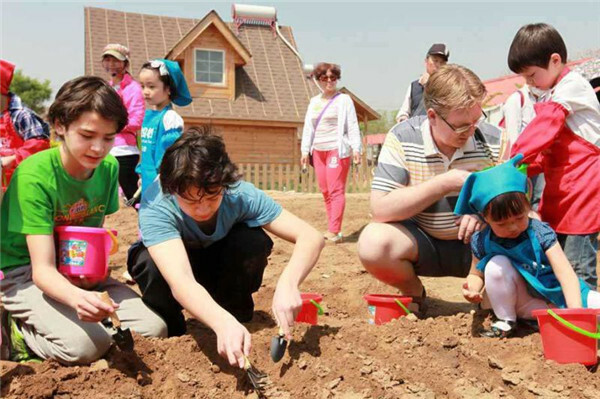 Some of what used to be the poorer agricultural counties of Beijing, like Changping or Miyun, have developed agricultural day or weekend trips for the more affluent city dwellers, as a new source of income. Food is a major ingredient of such a ‘day at the farmer’ experience. Those tourists as well come with expectations as strong as those of foreign tourists. They want to experience the humble food of the countryside, but not necessarily like the farmers’ daily grub. So as a result, ‘Farmers’ Food of Miyun’ has to be designed, just like the dandan noodle for tourists. It’s OK. The farmers in Miyun may like this new traditional foods so much, that they start eating them too, thus making it real farmers’ food. It is social constructionism at its best, and simultaneously a pleasure for the taste buds. I have already introduced the interest of Chinese urban dwellers in growing their own food on roof tops and balconies as a result of the food safety incidents of the past few years. Another development triggered by the food scare is the rise of self-farming. More and more urban residents rent a patch of land of suburban farm to grow their own fruits and vegetables. However, this is a not a completely economic endeavour. Taking the whole family out to your own mini-farm is also fun, and in the long run less expensive that taking the kids to an amusement park. Spending a day in the countryside, where the air is cleaner is also a bonus for the body. This has been discovered by the expat community as well, witness this picture of an outing organised by a foreign school in Beijing. Not all such farms have been successful in transforming into tourist farms, but there are cases of these farms being turned into thriving ventures. One such is Yifendi Farm, a cooperative run by Nanyuan Village in the Fengtai district of Beijing, set up in 2009. The farm covers more than 90,000 square meters, divided into 500 allotments of 66 square meters for renting. In 2011 it established another area of more than 100,000 square meters that was given the name Little Town Farm, divided into 400 allotments of 36 square meters each. Apart from a restaurant, the farm has also built dozens of wooden houses for people to stay over, and game centers where children can play with farm animals, including peacocks, chickens and horses. This entry was posted in Uncategorized and tagged disnyfication by eurasiaconsult. Bookmark the permalink.